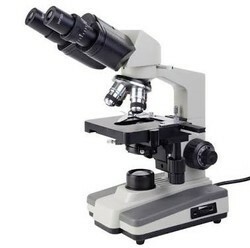 Tiltable Dental Microscope Rs 1.45 Lakh/Nos. Stand: Inclinable through 90. Mechanical tube length 160mm. 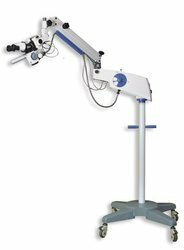 Owing to the years of industrial experience, we have been able to provide our valued clients with a wide range of Medical Microscope. Eye-piece: Extra wide field 10X Eye-piece specially designed for ultra series. Focusing: Separate knobs for coarse & fine motion. Coarse Focusing Range: 25 mm / Rotation. Fine Focusing Range: 2 mm / Rotation. - Stand Stable and Robust, assembled from Aluminium DIE-CAST parts. Stand: Stable & Robust, traditional Horse Shoe base. Body: Inclined through 90°, Standard tube length of 160 mm. Focusing: Separate coarse and fine focusing knob with graduation on one side. Coarse movement by Rack & Pinion and fine movement by Screw lever mechanism.